Now available from your favorite bookseller. 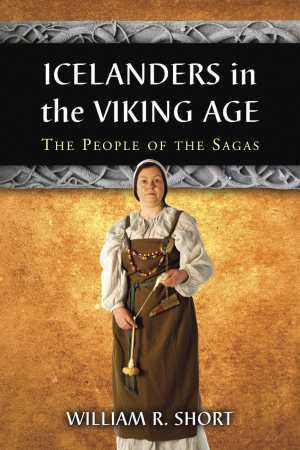 A companion to the Sagas of Icelanders and an introduction to the people of the sagas. 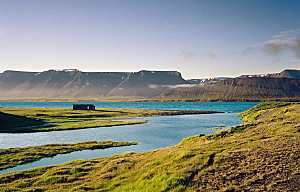 The Sagas of Icelanders are enduring and entertaining stories from Viking-age Iceland and are filled with love and romance, battles and feuds, comedy and tragedy. Yet these tales are little read today. Why don't more people read these stories for enjoyment and pleasure today? Part of the problem is that modern readers are not familiar with the people of the sagas, their lives, and the times in which they lived, so the stories make no sense to modern readers. The behavior of the characters in the sagas is confusing and irrational, though the audience for whom the tales were intended would have had an intimate understanding of the material. This book introduces the modern reader to the daily lives and material culture of the Viking-age Icelanders of the sagas. Topics covered include religion, law, social customs, the settlement of disputes, and major milestones in the lives of these people. Issues of dispute among scholars, such as the nature of settlement and the division of land, are addressed in the text. Additionally, the text provides a detailed overview of Iceland's Viking-age history and concludes with a précis of the history of Iceland after the Viking age and of the impact of the sagas on modern culture. The book is illustrated with maps and photographs that show the physical landscape of the sagas, and with images of historical artifacts from the Viking age. Icelanders in the Viking Age serves as a companion to the sagas, allowing a modern reader to share some of the enjoyment and delight that captivated medieval audiences of these engrossing tales. Personal appearances and events related to the book. 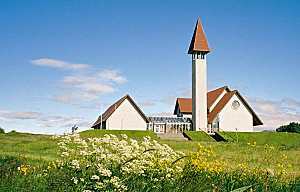 Þingeyrar: Iceland's first monastery was founded here at Þingeyrar and was a medieval center for learning. Some of the sagas were created in written form here for the first time. Vatnjökull: Iceland's landscape has been shaped by the forces of fire and ice, in the form of volcanoes and glaciers. 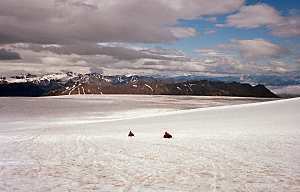 These forces come together here at the Vatnjökull glacier, which lies on top of active volcanoes. Kaldbakr: Landnámabók tells us that the settler Önundr tré-fótr (wooden leg) took land here at Kaldbakr. Önundr was uneasy about giving up his fertile fields in Norway for this cold-backed mountain. 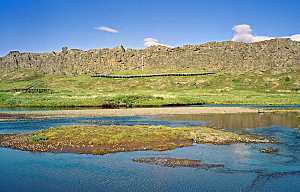 Þingvellir: Key events in many of the sagas take place at Þingvellir, the site of Iceland's national parliamentary assembly. The annual session was a time for serious legal business, but it was also a time for socializing with friends and family from across the land. Haukadalr: The differences between free men and slaves are starkly illustrated in an episode from Gísla saga that took place in Haukadalr. Gísli escaped his pursuers by taking advantage of the witlessness of his slave, Þórðr inn huglausi (the coward). Kjartanssteinn: Laxdæla saga says that the dispute between Kjartan and Bolli came to a head at Kjartanssteinn (Kjartan's stone). Here, Bolli reluctantly ambushed and killed his beloved foster-brother. 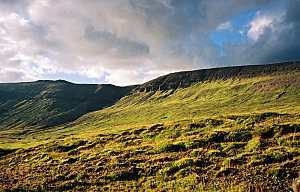 Bægifótshöfði: The ghost of Þórólfr bægifótr (twist-foot) terrified the local farmers until his son Arnkell reburied the corpse here at Bægifótshöfði, away from any farm. Eyrbyggja saga says that Arnkell also built a wall to keep the ghost from returning. 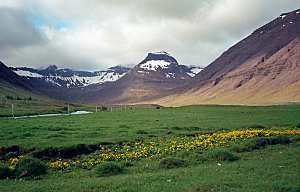 Sælingsdalr: Bolli's farm had summer pastures here at Sælingsdalr, according to Laxdæla saga. 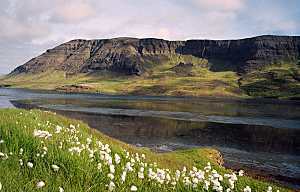 While working here with his wife Guðrún, he was attacked and killed to avenge the death of Kjartan. 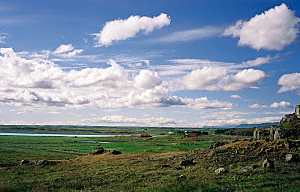 Hvítárvellir: Egils saga and other sources tell us that Hvítárvellir was an international market and trading center. Merchants beached their ships on the sandy beach and sold their wares on the open plain. 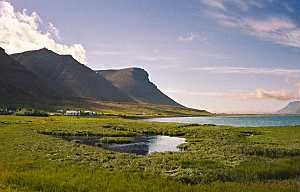 Haukadalsós: Þorbjörn súrr (sour-milk) and his family arrived in Iceland and sailed their ship into the Haukadalsós estuary here, according to Gísla saga. As the tide ebbed, the ship was gently deposited on the sandy bottom, where the cargo could be unloaded with dry feet. Seftjörn: Gísla saga says that people played knattleikr, the Viking ball game, near the pond Seftjörn. Little is known about the game, but it was clearly an enjoyable and often deadly pastime in the Viking age. 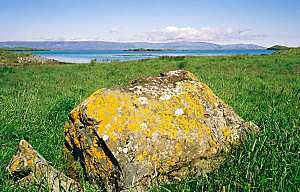 Þórssteinn: Humans were sacrificed on the stone Þórssteinn (Thor's stone), according to Eyrbyggja saga. 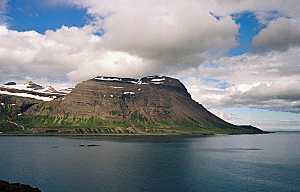 The stone was located at the assembly site immediately adjacent to the sacred mountain Helgafell. Leifsbúðir: Incontrovertible evidence of a Viking settlement in Newfoundland has been found. 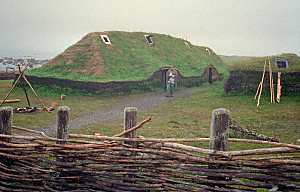 The site may be Leifsbúðir where, according to Grænlendinga saga, Leifr Eiríksson built houses similar to these reconstructed turfhouses. 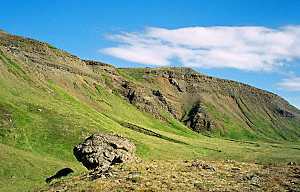 Reykholt: Snorri Sturluson, the saga author, poet, diplomat, and chieftain lived at Reykholt. 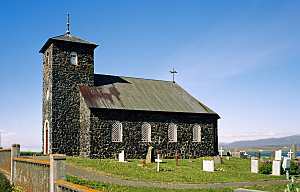 Today, Snorri's farm is the site of a church, museum, and medieval research center.